Remember the excitement you felt as a child when your birthday cake was carried into the room? At Bake Me a Wish!, we believe we all still have some of that child inside of us, and our goal is to help you recreate that excitement and experience for your friends, clients or loved ones. Bake Me a Wish! is the premium nationwide service for delivery of gourmet birthday cakes. Our cakes are made with only the finest, freshest ingredients by an award-winning family run New York bakery that also supplies pastries to some of Manhattan’s most elite restaurants. Through careful cost control and air-tight delivery systems, we are also happy to be able to bring you our fine cakes at an extremely affordable price. Now, whether it’s your son in college, your trusted associate, your old friend, or your granddaughter across the country, you will always have a simple and wonderful way to remember them on that important day of the year. I don’t know why I did it to myself, but I did. I agreed to a review of a Bake Me A Wish cake while on a Nutrisystem diet. But that’s okay, I’m a big girl. I decided to take the beautiful cake pictured above to share with my family on Thanksgiving. I was sent a chocolate mousse torte cake. The cake arrived in a carefully packed cooler with dry ice to keep it fresh. The cake comes in a pretty shiny decorative box and is wrapped in cellophane (again for freshness). I carefully placed it in my fridge and hoped for some willpower (Thanksgiving was 2 days away). The cake made it safely to my in-laws for Thanksgiving. Incredibly, I did not have a single crumb. I kept hearing comments like “It’s so rich!”, “Usually it’s just the frosting that is incredibly rich… the cake is rich, too!” and general moans of pleasure garbled with a few “ohhhhh”s and “yummmmmm”s. My brother-in-law was asking where the cake came from. I mentioned I had shown the website to my sister-in-law and he said “Oh, good. She’ll know where to go to buy one then!”. I would definitely say this cake was a success! In hindsight I wish I had had one tiny nibble, but the joy it brought to my family was worth the excess drool on my chin. 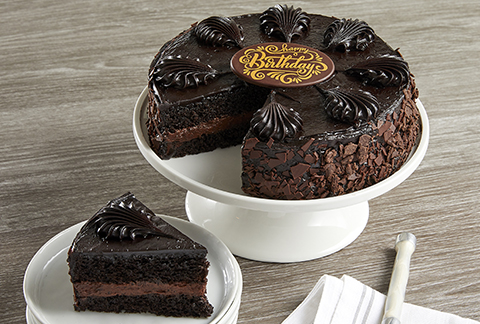 You can purchase the chocolate mousse torte cake for $39.95. 5% of your order will be used to assist our effort in sending gourmet occasion cakes to soldier’s overseas. If you have a soldier’s birthday approaching, click here to send a cake to an APO/FPO address. ONE OurKidsMom reader will win a Bake Me A Wish cake of their choice! You do not have to be a blogger to enter/win. An email address is required to enter. Please leave it in your comment or make sure one is visible for me to find in your Google profile. The winner will be chosen via random.org and contacted via email. A reply to the winning email is required within 48 hours before a new winner is chosen. This giveaway ends at 11:59 PM EST on December 16, 2010 and is open to residents of the US. PS – I totally voted for you on top mommy blogs! I “Like” Bake Me A Wish on Facebook as Lisa Pederson. I like you on FB as Lisa Pederson. i like Bake Me a Wish on Facebook as Angela Pinto. I like Bake Me A Wish on Facebook. I am a fan of Bake Me A Wish on Facebook! I like em on facebook. I liked Bake me on FB as me Carmen A! Entered the curious chef giveaway too! Liked Bake Me A Wish on FB! Entered to win Brugo Leakproof travel mug! Entered to win Ergo Baby Carrier! Entered to win TI-Nspire Calculator! Entered to win Flipped DVD! Entered to win Going the Distance DVD! Entered to win Dancing Deer Cookies! Entered to win Curious Chef Set! Entered to win Guitar Hero: Warriors of Rock! Entered to win Curious George Prize Pack! RSS? Yes! On google reader. I have your button at funnel full of soup entry #2. I entered the Snack & Travel Tray giveaway. Thanks so much for the chance to win one – I don't know if I'd have your willpower!! Entered to win Snapware Carriers! Entered to win Moms Family Calendar 2011! Entered to win Flirty Aprons! Entered to win Snack &Travel Tray! Entered to win Thomas &Friends: Lion of Sodor! Entered to win Pajama City giveaway! Entered Sesame Street game giveaway! and the Bake Me a Wish facebook! I "like" Bake Me a Wish on Facebook. #1) I subscribe to your RSS feed via Google Reader. #2) I subscribe to your RSS feed via Google Reader. I entered your TI Nspire Calculator Giveaway. I entered your Carmex Giveaway. I entered your "Flipped" DVD Giveaway. I entered your "Going the Distance" DVD Giveaway. I entered your Sharpie and Rubbermaid Giveaway. I entered your Sticky Bellies Giveaway. I entered your Tellurian Baby Giveaway. I signed up for your Snapware Giveaway. I signed up for your Mom's Family Calendar Giveaway. I entered your Flirty Aprons Giveaway. I entered your Snack and Play Travel Tray Giveaway. I entered your Thomas and Friends Giveaway. I entered your Pajama City Giveaway. I entered your EZ Socks Giveaway. I entered your Sesame Street Video Games Giveaway. I entered family calendar giveaway! I entered flirty aprons giveaway! I entered travel tray giveaway! I entered pajama city giveaway! I entered lions of sodor giveaway! I entered ez socks giveaway! I entered sesame street game giveaway! I follow you and BakeMeAWish on twitter(terri142)and tweeted. I entered your ZDecal giveaway. Entered Z Wall Decals giveaway! Facebook is not privacy secure. following on gfc and want some delicious cake! I “Like” Bake Me A Wish on Facebook!! I subscribed to OurKidsMom by email! Entry #1. I subscribed to OurKidsMom by email! Entry #2. I liked Bake me a Wish Cake on FB as Lyndsey Rullman. I like Bake Me A Wish on Facebook as myself. I entered your Snapware giveaway! I entered the Sticky Bellies giveaway! I like them on Facebook (Sarah Smile).